SKU Anantapur Distance B.Ed Admission 2019 - Applications are invited for admission in the following courses offered by the Directorate of Distance Education (DDE), Sri Krishnadevaraya University, Anantapuramu (Andhra Pradesh) under Distance Mode for the academic year 2019. 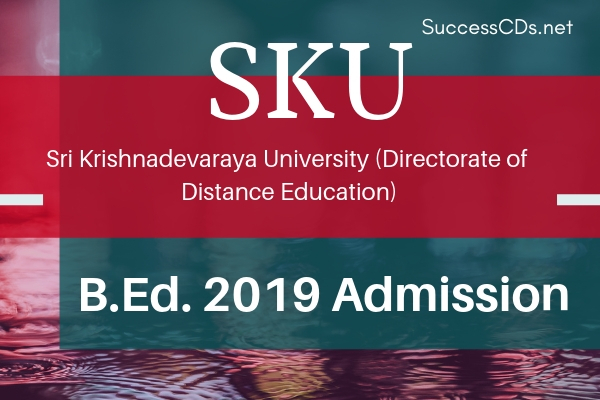 Candidates can check the complete details of SK University Distance Education Admission 2019 application process, eligibility criteria, and other information on this page below. Medium of Instruction: The medium of instruction will be English and Telugu only. Candidates should have passed with at least 50% of marks in B.A./B.Sc./B.Com./BCA/B.Sc. (Home Science) BBM and/ or in the Masters Degree in Sciences/Social Sciences/Humanities (Relevant subject of Pedagogy) at the time of submitting the application for B.Ed. Candidates should have secured a minimum of 50% marks in B.E/B.Tech with Science and Mathematics as one of the subjects or any other qualification equivalent thereto are eligible for admission into the B.Ed. ODL Programme. The candidates belonging to SC/ST/BC/PWD should have secured a minimum of 40% marks in the qualifying examination. Candidate should have completed 21 years of age as on 1st July 2018. There shall be no upper age limit. Trained in-service teachers with a Bachelor's Degree working in Government Recognized Schools or working in Educational Sector as primary, upper-primary teachers with SGT/PRT/TTC/D.Ed/D.El.Ed./D.P.Ed./B.P.Ed./Fine Arts course or any other NCTE recognized Teacher Education Program Through face-to-face mode. The candidates must fulfill eligibility as per NCTE, 2014 Regulations. Physical Science: Candidates with B.Sc. who have studied Physics and Chemistry of allied material sciences under Part-II group subjects or B.C.A. candidates with Physical Sciences (Physics and Chemistry) at Intermediate level as group subject. Biological Science: Candidates with B.Sc./B.Sc. (Home Science) who have studied Botany and Zoology or allied Life Sciences under Part-II group subjects or B.C.A. candidates with Biological Science at Intermediate level as group subject. Social Studies: All candidates with B.A/B.Com./ B.B.M. or B.C.A. candidates with Social Sciences at Intermediate level as group subject. SK University will issue the schedule and venue for the Spot Admission into B.Ed course under Distance Education Mode for the academic year 2018-19. The candidates who were not alloted seats earlier can attend the spot admission with all the necessary documents given below. The date, time and venue of the counselling will also be provided here. Candidates have to pay a Registration Fee of Rs 300/- (non-refundable) and course fee Rs 18000/- + Rs 150/- towards migration fee (other than S.K. University Degree holders) at the time of counselling. The admissions are subject to the rules of the Government of A.P., NCTE and the S.K. University. Admission will be done on the basis of length of service as on Dec 31, 2018. Reservation of seats will be followed in accordance with the G.O.s of Govt. of Andhra Pradesh with regard to various categories and reservation of women. 85% of the seats in each methodology shall be reserved for the Local candidates and 15% of the seats shall be left unreserved as specified in the Andhra Pradesh Educational Institution (Regulation of Admission) Order 1974 as amended in G.O P.No.646 Education (W) Dept. dated 10-7-1979. The part of the State comprising the district of Ananthapuramu, Kurnool, Chittoor, Kadapa, and Nellore shall be regarded as S.K. University local area. The entries in the online application form should be filled in carefully by the applicants. The candidates should write his/her name, address, course and the purpose for which the payment was made on the reverse side of the Demand Draft. Postal orders, Money orders, Mail transfers, Challans and Cash payment will not be accepted. One recent photograph of passport size should be pasted on the application form in the space provided for it.